Officially known as Sri.Chamarajendra Park, Cubbon Park is situated in the heart of the Bengalaru city's main administrative centre. It is just 5 km away from the railway station. 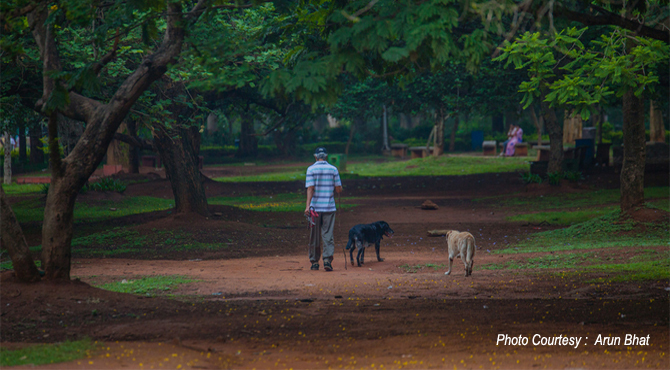 Lies adjacent to the Vidhana Soudha, Cubbon Park is often inhabited mostly by morning and evening walkers and naturalists. Beautiful roads, flowering trees and placid plains, shady bowers and the lawns with vibrant flower beds, make the park an ideal place for spending your spare time. Initially, the park was named after Sir Mark Cubbon, Bangalore's longest serving commissioner but later rechristened as Sri Charmarajendra Park to commemorate the Silver Jubilee of Sri Krishnaraja Wodeyar’s rule in Bangalore State, in the year 1927. This beautiful park was planned and laid out in 1864 by Sir. Richard Sankey, the then Chief Engineer of Bangalore. It was basically designed as a public park in an area of about 100 acres and expanded over the years and now, cover almost 300 acres which is one of the reasons why Bangalore is known as the 'Garden City'. The park is maintained by the Department of Horticulture of Government of Karnataka. Cubbon park has various attractions such as the rose garden, doll museum, Jawahar Bal Bhavan with its mini theatre, toy train and several play equipments. Immediately adjacent to this park are a group of neo-classical styled buildings like Attara Kacheri, central library, aquarium and KSLTA tennis court. The State Archeological Museum here set up in 1866 by Colonel Sankey, houses exquisite specimens of Vijayanagara and Halebid, Mohenjadaro architecture, ancient coins and stone inscriptions which take us 5000 years back in time. This beautiful museum, similar in design to the Attara Kacheri comprises of 18 enclosures. It is one of the oldest ones in India and can be visited on all days except Mondays between 8 am and 5 pm. The children can have a lot of fun in the children's park and also in the pleasure train. The Venkatappa Art Gallery, a recent enclosure to the park is a room structure which displays the exciting paintings of Venkatappa, the court painter to the Maharaja of Mysore in the early 20th century. The beautiful works of contemporary artists are also displayed. The gallery can be visited on all days except Wednesdays. The Park is open to the public at all times but the roads are closed for traffic from 5 am to 8 am every day.